Walter Russell, English physician, 1895-1966. See: Brain reflex. That part of the central nervous system contained within the cranium. See also: encephalon. 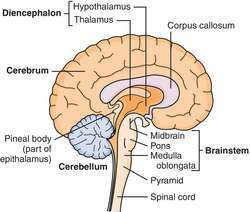 Compare: cerebrum, cerebellum. (brān) encephalon; that part of the central nervous system contained within the cranium, comprising the prosencephalon (forebrain), mesencephalon (midbrain), and rhombencephalon (hindbrain); it develops from the anterior part of the embryonic neural tube. See also cerebrum. split brain one in which the connections between the hemispheres have been disrupted or severed; used to provide access to the third ventricle or to control epilepsy. the portion of the central nervous system contained within the cranium. It consists principally of the cerebrum, thalamus, hypothalamus, cerebellum, midbrain, pons, and medulla. Specialized cells in its mass of convoluted, soft gray or white tissue coordinate and regulate the functions of the central nervous system, integrating the functions of the body as a whole. The epicentre of the central nervous system, which is located within the cranial vault and divided into the right and left hemispheres. The brain functions as a primary receiver, organiser and distributor of information for the body; it is the centre of thought and emotion, co-ordinates and controls bodily activities and interprets sensory visual, auditory, olfactory, tactile and other information. A large highly-organized complex of neuron cell bodies, axons, dendrites, and glia filling the cavity inside the skull; the brain is enwrapped by fluid-filled protective membranes called meninges. The central organ of the body, to the maintenance, supply, transport and protection of which all the remainder of the body is dedicated. The brain contain more than 100 billion nerve cells with more than 1015 synapses. There are two main parts to the brain, the cerebrum and the cerebellum. The larger part, the cerebrum, initiates and coordinates all voluntary and most involuntary functions and is the seat of emotion, memory and intelligence. It is the medium by which all sensation, and the results of the mechanisms underlying all satisfaction, are conveyed to consciousness. It is essentially concerned with the collection, processing and storage of information, with the correlation of new data with stored data and with the organization and control of resulting responsive action. Response to stimulus is of the essence of brain function. Much is known, from the effects of disease and injury, of the localization of functions, in the brain, such as movement, sensation, vision, hearing, smell and speech. The location of areas responsible for registration and recall of memory is known, but the physical basis of memory storage remains obscure. Memory is not, like some other functions, located in a single definable area but is probably dispersed into all areas concerned with functions which may involve it. The cerebellum, the smaller part, is concerned mainly with the complex computations necessary to organize the muscle contractions needed to maintain the balance of the body and to allow walking and other movements. More than one tenth of the cardiac output is required to maintain brain function. See also BRAINSTEM. Fig. 80 Brain . 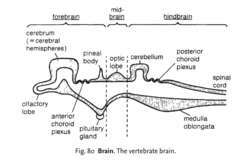 The vertebrate brain. the enlarged part of the CENTRAL NERVOUS SYSTEM beginning at the anterior end of bilaterally symmetrical animals (see BILATERAL SYMMETRY). The enlargement is associated with the aggregation of sense organs at the point which first contacts the changing environment. The brain, together with the rest of the central nervous system, coordinates the body functions. See also HEAD, CEPHALIZATION. the part of the central nervous system (CNS) within the skull. 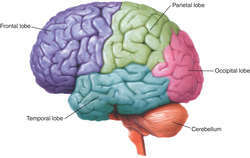 Uppermost are the anatomically symmetrical left and right cerebral hemispheres with frontal, temporal and occipital lobes, the grey matter of the cerebral cortex forming the infolded outermost layer. Below the hemispheres the central brain stem (midbrain, pons and medulla oblongata), is in continuity with the spinal cord at the large hole (foramen magnum) in the base of the skull. The main sensory and motor nerve tracts to and from the cerebral hemispheres cross over in the brain stem, so brain damage on one side (e.g. 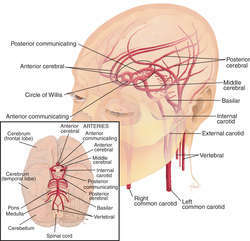 stroke) disturbs function on the opposite side of the body. The cerebellum, also with a cortex of grey matter, lies behind and alongside the brain stem, with connections to it, and relays up and down to other parts of the CNS. grey matter refers to regions and clusters consisting mainly of neuron cell bodies (forming the cortical layers and more deeply the various control centres and 'nuclei'); white matter is composed mainly of myelinated nerve fibres in the tracts that link neurons in the different parts of the brain to each other and to the spinal cord. 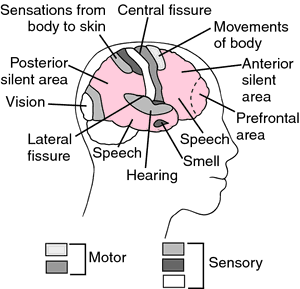 Interconnecting cerebral ventricles deep in the brain contain cerebrospinal fluid (CSF), in continuity with CSF on the surface of both brain and spinal cord, where it is enclosed within membranous coverings, the meninges. See Figure 1. Q. What effect it will have in his brain………. hi all…………..whenever my bipolar son gets in to different episodes it makes me to think what effect it will have in his brain……….does it got anything to do with brain? But It didn’t strike me to discuss about this with my doctor…. A. after a while without treatment it's hard to stay without any kind of brain damage... the brain is a biological material which is affected by materials that ravage it over and over again. bipolar disorder can get worse, adding hallucinations and such. Q. Does the brain recognize pain? How does the brain recognize pain. A. First let us see the creation of the nerves which are assigned for different duties. There are roughly twenty different kinds of nerve endings in your skin that tell you if something is hot, cold, or painful. 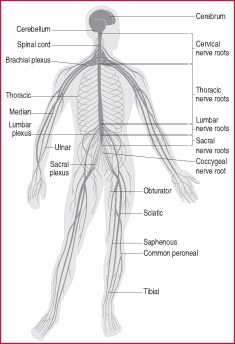 These nerve endings convert mechanical, thermal, or chemical energy into electrical signals that convey information to the brain and spinal cord - also known as the central nervous system or CNS. These signals travel to areas of your CNS where you perceive the stimuli as the painful sensations you actually feel - sensations such as searing, burning, pounding, or throbbing. Research suggests that the pain associated with fibromyalgia is caused by a "glitch" in the way the body processes pain. This glitch results in a hypersensitivity to stimuli that normally are not painful. According to the National Institute of Arthritis and Musculoskeletal and Skin Diseases (NIAMS), research has shown that people with fibromyalgia have reduced blood flow to parts of the brain.